This interactive retelling of the Three Little Pigs story allows the reader to play the part of the big bad wolf. Three interior die-cut holes invite readers to huff, puff, and blow the pigs' houses down! This fractured fairy tale ends sweetly when, rather than blowing down the third pig's brick home, the wolf/reader blows out the candles on a cake baked by the pigs! A satisfying and engaging read for every young Three Little Pigs fan. 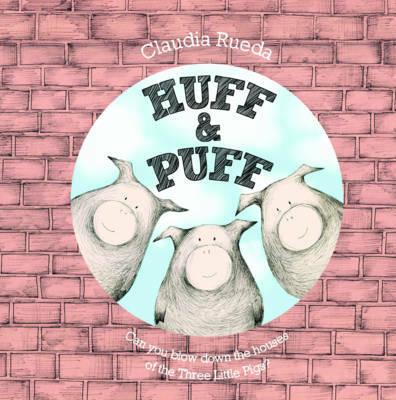 Praise for Huff & Puff "Simple but wonderfully expressive, the illustrations are ink drawings with pale washes of tan, pink, yellow, and blue. A beautifully designed and wholly engaging picture book for young children." "Sure to be a family favorite." "A good chance for youngsters to relish enacting the wicked role while still getting a friendly reconciliation at the end." "Very young readers will get a kick out of taking the wolf's part, and their parents will appreciate that the scariest bits of the original tale have been omitted." "Like her repetitive text, Rueda's illustrations are gently funny and elegantly simple." "The reader is encouraged to follow the pigs into the book."